“A selcouth thing” (an amazing thing) was what one witness called it. 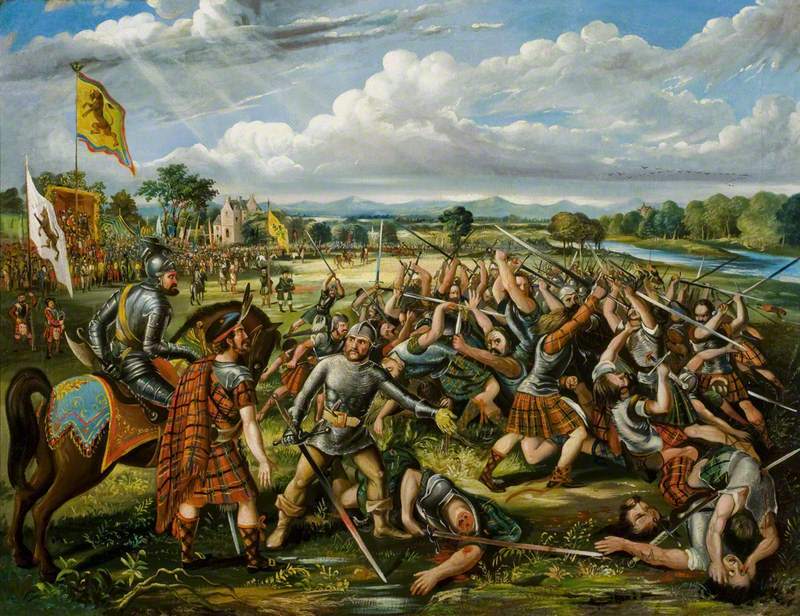 The Battle of the Clans (also known as the Battle of the North Inch) was a duel between two sides of thirty highland warriors in which quarter was neither given nor asked. Intended to resolve a raging feud that threatened Scotland’s stability in 1396, the contest was a shocking spectacle, notable even in an age that concealed its brutality behind a veil of chivalry. Taking place in a makeshift arena before the King, his court, foreign dignitaries and hundreds of spectators, the Battle of the Clans was a reversion to the gladiatorial games of pagan Rome. This trial by combat was also a reflection of the tensions between the culture of the Lowland Scots and their Anglo-Norman rulers and the tribalism of the Celtic Highlanders. Those tensions would remain unresolved until the final clash of cultures on the field of Culloden in 1745. For the historian the Battle at the North Inch of Perth presents a number of challenges, relying as it does on a pair of accounts by chroniclers who may or may not have been witnesses, later Latin manuscript histories, oral traditions and a handful of questionable but fascinating artifacts. The traditions have been inexorably coloured by later embellishments and the inventions of novelist Sir Walter Scott, who used the traditions as the basis of a novel in the 19th century. While oral traditions have displayed remarkably accuracy in some parts of the world, they are often malleable in regions where they form the basis of rival land claims, questions of precedence or tribal pride. The highland region of Scotland filled all these criteria in the pre-modern era. The absence of such a notable event from most official records suggests that the entire exercise was regarded by the authorities as a somewhat shameful failure, best not to be mentioned again. The fourteenth century Scottish highland region was still an isolated and undeveloped district of great forests, deep cold lakes and rocky peaks uncrossed by any road. Towns were few, with most of the population scattered through the glens (valleys), where they pursued a pastoral life, occasionally enlivened by raids against their neighbours and disputes over land. What went on in the highlands was still largely a mystery to the outside world, including Scotland’s king, Robert III Stewart. The combat at Perth was likely the result of a feud that erupted around 1333 between Clan Cameron and Clan Chattan, two powerful highland confederacies. Most major disputes in the highlands were over land, and this one was no different, involving a claim for restoration of MacIntosh (or MacKintosh) lands in Lochaber temporarily held by the Camerons. The MacIntosh chief, leader of the Clan Chattan confederacy, attacked and defeated the Camerons at Drumlui, and the feud was on. As the fighting took its toll, each confederation began to call on its complex network of allies for armed support, threatening to plunge the entire highland region into a cauldron of unstoppable violence. The fight at Drumlui was followed by the Battle of Invernahavon, which took place in either 1370 or 1386. This fierce struggle pitted the MacPhersons, Davidsons and MacIntoshes (the main elements of Clan Chattan) against some four hundred warriors of the Clan Cameron, returning home from a raid on Clan Chattan lands in Badenoch. A dispute broke out on the battlefield between the MacPhersons and the Davidsons as to which group would take the prestigious position on the right of the battle-line (a familiar dispute amongst the proud highlanders, arising even centuries later as the clans took to the battlefield at Culloden). The MacIntosh chief settled the dispute in favour of the Davidsons (the MacIntosh had taken control of the Clan Chattan chieftainship from the older Davidson chiefs by marriage in 1291). Typically, there are two accounts of what happened next. In the first, the MacPherson chief was offended by the decision and withdrew with his men, but on seeing the Davidsons and MacIntoshes being overwhelmed by their Cameron opponents, the MacPherson chief joined the battle in a fury, turning the tide and slaying the Cameron chief, Charles MacGiloney. The other version states that the Davidsons and MacIntoshes were soundly defeated after the MacPhersons withdrew. According to this account, the following night the MacIntosh chief sent his bard to the MacPherson camp disguised as a Cameron. The bard (whose personal safety was traditionally inviolable) accused the MacPhersons of cowardice for failing to show in the battle, resulting in the outraged MacPherson chief leading his men in a savage attack on the Camerons the next morning. In those days there was no law in Scotland, but the strong opposed the weak and the whole kingdom was one den of thieves. Homicides, robberies, fire-raisings and other misdeeds remained unpunished, and justice seemed banished beyond the king’s bounds. By late September 1396, the decision had been made at court to solve the dangerous clan dispute by means of judicial combat, to take place at the North Inch of Perth under the supervision of the King of Scotland, Robert III (Stewart). The “North Inch” was an area of low-lying land beside the River Tay, just outside the town walls and home to a monastery of Dominican priests known as “The Black Friars.” The choice of Perth for this unusual mass duel was likely due to the favour shown the town by the king as a residence. At this time, as in many mediaeval societies, the Scottish king and court had no permanent home, preferring instead to pass from place to place, allowing the king to “show the flag” when and where convenient or necessary. Robert III enjoyed his stays at the Black Friars’ monastery at Perth best, and the marshy ground of the North Inch was a natural choice for the contest, having already been used for a number of individual trials-by-combat. The contemporary chronicler Bower claimed the affair was the work of Sir David Lindsay of Glen Esk (who had prevented a rout at Glasclune) and Thomas Dunbar, Earl of Moray. These nobles no doubt intended to take a bold action designed to demonstrate the assertion of the King’s law in the highlands to those lowland nobles who had protested the king’s inability to establish law and order. Their sovereign, Robert III, was a weak ruler who became even more ineffective after a kick from a horse left him lame at roughly 50 years of age. Some writers have suggested that the classically educated nobles advising the king may have looked to the precedent of the fight between the Horatii and Curiatii recounted in Livy. This 7th century BC match was between two sets of triplets, the Horatii of Rome and the Curiatii representing Alba Longa, to decide the outcome of a war between the two nations. For Lindsay of Glen Esk, it may have been an opportunity to take a subtle revenge on the warriors of “Clan Qwhele” (possibly an early term for Clan Chattan) who had bested the lowland knights at Glasclune. The idea of a contest may have had special appeal to Lindsay, a frequent participant in cross-border jousting tournaments. David Lindsay was one of the most successful knights of his age, matching superior fighting skills with a quick but eloquent tongue. In 1390 Lindsay accepted a challenge from Richard II’s ambassador to Scotland, John Lord Welles. In a famous contest carried out in front of Richard and his court on London Bridge, Lindsay absorbed his opponent’s best blow on the first pass without being knocked off his horse. With the crowd screaming that the Scotsman was cheating by being tied to his horse, Lindsay rode up before the king, jumped off his horse in his heavy armour and then remounted without any assistance or use of the stirrup (as recounted in the Scottish account of Prior Wyntoun). Two passes later Lindsay dismounted and the two fought with daggers until Welles lay at the Scottish knight’s mercy. Lindsay married a daughter of Scotland’s King Robert II and became one of the most powerful men in Scotland in 1398 when he became the Earl of Crawford. As a judicial contest, the number of warriors involved, thirty to each side, may have been based on a part of old Scots Law, which required 30 “compurgators” (witnesses to the innocence of a person) to clear an accused. There was also a precedent in the 1355 “Battle of the Thirty.” This combat arose after Richard Bembrough, an English knight commanding a garrison in Brittany (the Celtic north-west region of modern France), ravaged the countryside in revenge for the death of a fellow knight. His massacres of innocent civilians (including the craftsmen and laborers so vital to the economy) brought a reproach from a Breton knight, the Sire de Beaumanoir. Bembrough answered with insults, which brought a challenge from the Breton to meet him for a combat of thirty men to each side. Many residents of the region witnessed the affair, but the accounts of what actually happened are tainted by ethnic chauvinism and the propensity of the chroniclers to emphasize the chivalry of their own side and the treachery of the other. One account claims that the English knights were destroyed to a man, while others suggest that as few as 4 to 5 men of either side were killed. In the reign of Scotland’s David II twenty Scottish knights fought twenty English knights in a contest at Berwick in 1338. The combat appears to have been a test of strength more than a battle to the death, with only one Scottish and two English knights killed. In 1340 Edward III of England challenged King Philippe de Valois of France to join him in battle with 100 picked men on each side. Edward had once given his allegiance to the French king as part of a deal involving a transfer of lands to the English king, and Philippe now took the opportunity to rudely remind Edward that a King could not meet with a vassal in such a way. When his fortunes in the war with England began to wane, Philippe attempted to accept the challenge, which was this time declined by Edward. The chronicler Andrew Wyntoun was Prior of the St. Serf monastery at nearby Loch Leven, and is believed to have walked the twenty miles to the battle-ground at Perth, though it is also possible that all his information on the affair was gained through hearsay. The monk did not bother to record his memories until sometime between 1420 and 1424. Unfortunately, Wyntoun gives us little of the political or historical background of the affair, and his versions of the names involved reflect the difficulty or indifference with which “barbarous” Celtic names were rendered into English or Latin by lowland scholars at the time. The Clan Qwhewyl (or Owhele) almost certainly represents the Clan Chattan, a confederation of related families (MacPhersons, Davidsons, and MacIntoshes) and a number of smaller unrelated septs or subgroups (notably the MacGillivrays and MacBeans) which found strength through association with a larger group. The number of these septs of Clan Chattan would increase greatly in the 15th century. The identity of the other feuding clan, the Clan Ha (or Kay in some accounts) is more contentious, but a majority opinion seems to have finally settled on Clan Cameron’s claims to have been the warring party. The seemingly obvious solution that it was Clan MacKay has been disproved on historical and philological grounds. The fact that the lands of Clan Chattan and Clan MacKay were significantly distant from one another also argues against the existence of any enduring conflict. The Camerons were also a confederation of clans, incorporating MacMartins, MacGillonies and MacSorlies, though unlike Clan Chattan, the members of this confederacy mostly gathered under a single name, Cameron. They were prominent in the Lochaber area, one of the territories known to have been in dispute between Clan Chattan and the Camerons at the time. Barriers were constructed around three sides of the intended battleground, the River Tay forming the fourth side. Viewing stands were erected for the King, his court, and noble visitors, some of whom came all the way from France for the spectacle. There was no doubt a large turnout from Perth, and hundreds of spectators and vendors must have flocked in from the hinterland to take in this once-in-a-lifetime event. The funds for erecting the grandstands were taken from the King’s customs account at Perth. The exchequer rolls record the expenditure of £ 14:2:11 “for timber, iron and making of lists (enclosures) for 60 persons fighting in the Inch of Perth”. Bower’s version of the affair, written about 25 years after Wyntoun’s original account, represents the first mention of the absence of one of the fighters and his replacement by the Perth smith, Henry Wynd, “a man of moderate height but savage appearance.” The account of the smith’s role in the battle, though colourful, is still questionable since it does not appear in Wyntoun’s earlier account. If Wyntoun was, as believed, an eyewitness to the combat, it seems difficult to believe he could have forgotten or neglected to mention the participation of the bandy-legged smith who was, as will be seen, a central character in later accounts of the drama. Like Wyntoun, we cannot be sure if Bower was an eyewitness. Distance from the event suggests he was not, but if he was, he was writing as an old man of events some fifty years in the past. Like so many aspects of this strange story, the participation of the smith may have been real, or may have been added by the later chronicler to give some interest to what may have in reality been a very dark and un-inspirational day beside the River Tay. With the fight on once more the fighters, following highland tradition, would have stripped to their saffron-coloured undershirts, tying the long garment between their legs before going into battle. Chain mail was the usual costume of professional warriors in the Highlands at this time, but protection of the combatants did not figure into the scheme of the contest’s organizers. Before highlanders met in battle it was customary for a bard from each side to recite a poem intended to incite the warriors and remind them of their duty to their clan. Following this the warriors would have hurled insults and brandished their weapons while awaiting the sound of the trumpet that would launch the fray. The trumpets of the king sounded a charge, the bagpipes blew up their screaming and maddening notes, and the combatants, starting forward in regular order, and increasing their pace till they came to a smart run, met together in the centre of the ground, as a furious torrent encounters an advancing tide. For an instant or two the front lines, hewing at each other with their long swords, seemed engaged in a succession of single combats; but the second and third ranks soon came up on either side, actuated alike by the eagerness of hatred and the thirst of honour, pressed through the intervals, and rendered the scene a tumultuous chaos, over which the huge swords rose and sunk, some still glittering, others streaming with blood, appearing, from the wild rapidity with which they were swayed, rather to be put in motion by some complicated machinery, than to be wielded by human hands. From time to time it would have been necessary for the combatants to break off and rest from their exertions, and to attempt to staunch the flow of blood from the worst of their wounds. The fight would resume on fresh ground, unencumbered by the mutilated bodies of their dying comrades. A story from the folklore of the MacPherson clan (and repeated by Scott in The Fair Maid of Perth) describes the pipers of the respective clans becoming enraged by the slaughter, dropping their pipes to go at each other with knives. Having slain his opponent, the mortally wounded Clan Chattan piper is said to have picked up his pipes to play the clan anthem with his dying breath. The clash of pipers appears, unfortunately, to be yet another late addition to the saga, making its first appearance on paper in the early 19th century. The oral tradition may be much older, but almost certainly does not go back before the 17th century. After several hours of bloodletting, there remained only one man opposing Clan Chattan, alone against eleven heavily wounded representatives of the Clan of the Cat. Rightly judging his chance of survival as nil, the warrior tossed his sword away and struck out across the River Tay. If he indeed survived the swim (and he must have been badly wounded himself), the warrior was never heard from again, though Scott recorded a folk-tale in which the man was so poorly received on his return to his kin in the highlands that he killed himself. One might compare his fate to that of Henry de Essex, standard-bearer of Henry II of England. Left for dead after losing a trial by combat he was saved by nearby monks and taken to their abbey where he remained for the rest of his life. As Millingen points out in his History of Duelling, Henry de Essex was considered morally dead, and his return to the living world beyond the cloisters was inconceivable. The smith of Perth was another matter, however. Having played a decisive role in the fight on the side of Clan Chattan, the smith was afterwards asked if he even understood for what he had fought so relentlessly. The smith was said to have replied that he had “fought for his own hand,” a phrase that passed into Scottish lore. Clan Chattan appears to have honoured its promise to the smith, who is said to have left for the North with his fellow survivors, settling in Strahavon. His descendants became known as Sliochd an Gobh Cruim (“the race of the crooked smith,” referring to his bandy-legs), and may still be found in the area as a sept of Clan Chattan, bearing the names of Smith or its Gaelic equivalent, Gow. A highland account of the battle written in 1461 gives a number of different details. Buchanan’s Book of Pluscarden records that seven men survived the contest, five on one side and two on the other. Of these two, one managed to cross the River Tay, while the other was either pardoned or hung. The smith is said to have been related to the winning clan (differing here from virtually every other account), though Buchanan does not mention the clans by name. Wyntoun (our first “eye-witness,” if he was so) did not state who won the contest or how many were killed, so our earliest information about the results in terms of casualties comes from Bower’s account, written over 50 years after the event. Lachlan, chief of MacKintosh and of the Clan Chattan, being too old and infirm to take the field in person, deputed his kinsman, Shaw “Mor,” a warrior of tried valour and established renown, to fill his place in the combat at Perth; and as a reward for the victory which he obtained, Shaw was presented by the chief with the lands of Rothimurcus in Badenoch. So little eminence… appears to have been among them [the fighters], that even the men who are said to have been the heads of the quarrel on either side are not identified by Celtic antiquaries with anything like certainty as belonging to eminent or even known Highland families. They cannot be fitted into any of the genealogies, accurate or fabulous, to be found in the peerages and family histories, nor has anyone been able to show the districts over which they ruled. The participation of Clan Chattan in the duel is undisputed, but there has been considerable controversy over their opponents. Many have suggested that the battle was actually between two branches of Clan Chattan vying for prominence. Traditions held by the MacPhersons and the Davidsons (both Clan Chattan) insist that the Camerons had no part in the contest. Arguing against this claim is the fact that in the late 14th century, the constituent families of Clan Chattan were neither large nor powerful on their own, and a feud between two individual groups within the confederation would hardly have been of enough seriousness as to threaten the stability of the whole nation, the given reason for the duel. The combative Clan Cameron confederation and their long-standing quarrel with Clan Chattan makes them a much more likely opponent in the contest at Perth. There is also some evidence that Clan Cameron had not yet adopted that name in the 14th century, so they may well have been known as Clan ‘Ha’ at the time. It is nearly impossible to say with certainty exactly who were the opponents at the North Inch, but a group of warriors from the leading clans of the Chattan confederacy versus a group of Clan Cameron warriors seems most likely, but far from definite, with strong MacPherson traditions in need of account. Clan Davidson maintains that it formed one of the two sides in what it interprets as a battle for the Clan Chattan leadership, and in 1996 held a celebration in Perth of the 600th anniversary of the Battle of the North Inch, the clan piper playing a new piece commissioned for the occasion. Shaw’s opponent in the battle, the Cameron leader Cristy Johnesone (as named by Wyntoun), does not appear to have survived the battle. This may be the same individual as the Gilchrist MacIan (MacIan being Gaelic for “son of John,” or “Johnsone”) mentioned in a manuscript history of the MacIntoshes as a leader of the chiefly house of Clan Chattan at the time. The mass duel at Perth had little political legacy. Though the Scottish court may have been relieved to remove so many troublesome warriors from the scene in one day, both highland confederacies were large enough to withstand the loss. Neither side would have taken the result of the combat at Perth as a decision against them in their feud. The Norman rules of law that lay behind this judicial contest of arms were unknown in the highlands. There the code of blood revenge would have dictated further rounds of bloodletting in return for the deeds of that September afternoon. If the clans involved were indeed the Chattan and the Camerons, it is known that they were at each other’s throats once again early in the 15th century. There are records of a particularly ruthless attack on Palm Sunday, 1429, in which the Clan Chattan set fire to a church where a sept of Clan Cameron was gathered, killing most of those gathered within. The contenders for leadership of the Clan Chattan were not above fighting each other, as at the Battle of Glenlivet in 1594. The leadership dispute was eventually settled in court near the end of the 17th century, legal proceedings having replaced “battles to the death” by this time. The fact that the contest at Perth was largely ignored by official records after its conclusion and was never repeated would seem to confirm the ineffectiveness of this form of trial by combat as a means of dispute resolution amongst the highlanders. The idea of a mass duel to resolve an otherwise intractable clan feud was tried once again in the mid-15th century, again with unsatisfactory results. In this case the opponents were the Gunn and Keith clans, seeking to bring some resolution to a feud that had claimed so many lives there were barely enough men left to grow food. The Gunns were descended from Norsemen who had once ruled northern Scotland. For centuries, the Gunns had seen their power and lands rolled back as the Celtic Scots grew stronger. In this way the Celtic Keiths emerged as the Gunns’ main rival in the remote north-eastern territory of Caithness. The chiefs of both clans agreed to meet at the Chapel of St. Tears near Ackergill with a dozen horsemen each. The Gunns and their chief arrived first, using the opportunity to pray before battle. The Keiths arrived later with two men to a horse, giving them an enormous advantage. The Keiths fell on the outnumbered Gunns inside the chapel, eventually slaying each of their opponents despite a fierce resistance by the Gunns that claimed many Keith lives. 150 years later the blood of the victims reportedly still stained the walls of the building. The unequal contest solved nothing and the two clans were soon at each other’s throats once again. Years later the grandson of the Gunn chief ambushed the son of the treacherous Keith chief who led the attack and a dozen of his men, massacring the whole group in revenge for the slaughter at St. Tears. Ill feelings between the clans persisted until 1978, when a treaty of friendship was signed at the site of the now vanished chapel. The Edinburgh novelist, Sir Walter Scott, dipped heavily into Scottish history and folklore for his stories, and the battle at North Inch did not escape his attention. Scott incorporated the story of the fight into his novel The Fair Maid of Perth (1828), focusing on the story of the Perth native Henry Smith (or Henry of the Wynd). The building Scott described as the home of Catherine Glover, the ‘Fair Maid’ of the novel, can still be seen in Perth. Though the building is the oldest house in Perth, it probably does not date earlier than the 15th century. The building was once the headquarters of the glovers’ trade in the densely populated mediaeval industrial suburb of Perth North Port. The area fell into decay and gained an unsavoury reputation until most structures were demolished in the 1930s. Scott’s account of the battle at North Inch features a remarkable display of devotion as the foster father and eight foster brothers of Eachin (‘Hector’, the son of the Clan Qwhele chief) sacrifice themselves to save the young man from the attacks of the Chattan warriors. As each falls in turn another foster-brother replaces the last with the cry “Another for Hector!” Scott’s model for this part of the narrative comes not from the ancient chroniclers but from an incident recorded in the 1651 British Civil War battle of Inverkeithing involving Sir Hector MacLean, (Eachann Ruadh – ‘Red Hector’), 18th Chief of the Clan MacLean. Three battalions of lowland troops and 1500 MacLean and Buchanan clansmen who had rallied to the Royalist banner were abandoned at Inverkeithing by the Royalist horse in the face of Oliver Cromwell’s Parliamentarian force, at least twice their number. The lowland infantry on the highlanders’ right broke under the weight of repeated charges by the enemy, who controlled the high ground. Sir Hector refused to retreat under a Parliamentarian bombardment, though his men grew increasingly agitated, being unused to standing fast under artillery fire. Seeing this, Red Hector finally ordered his highlanders to charge their tormenters uphill, the only alternative to retreat. Quickly beset on all sides by the enemy, the highlanders formed a rough square around Red Hector. For four hours repeated attacks by Cromwell’s veterans resulted in enormous losses to both sides. Red Hector continued to rally his men despite many wounds, and the Parliamentarian troops eventually began to focus on killing or capturing him. One after another of Hector’s loyal clansmen hurled themselves at the advancing enemy to protect their chief, each screaming in Gaelic, “Far eil air son Eachann!” (Another for Hector!). Eight men died in this fashion before a bullet to Hector’s chest ended the struggle. Only 40 of Red Hector’s 800 MacLeans survived the slaughter, nearly all of them badly wounded. Scott’s version of the North Inch battle was never intended to be an historical account. The author always preferred vague and often disputed historical traditions as the basis of his stories, as he then felt relieved of any pressure to abandon the novelist’s craft in favour of the historian’s rigour. In 1745 the Battle of Culloden brought an end to the Jacobite rebellion and dreams of a Stewart restoration in Britain. The Highland charge, which had triumphed so many times against English arms in the past, proved unequal that day to the disciplined fire and bayonet drill of the Duke of Cumberland’s army (which included English regulars, lowland Scottish troops and anti-Jacobite highlanders). Leading the Jacobite charge were the MacIntoshes of Clan Chattan, who left nearly their entire fighting strength in the mass graves of the battlefield. The Camerons were right behind them, their shot and bayonet-mangled bodies left intermingled with those of their ancient rivals. After the tragic finale to the “Rising of ’45,” the North Inch of Perth became home to a camp of Hessian troops, part of a 5,000 man force brought from Germany by the Hanover King of England to help subdue the highlanders. The monastery of the Black Friars that once dominated the battleground was already a distant memory, having been destroyed by a mob in the Reformation of 1559 after a particularly incendiary sermon by reformer John Knox. After Culloden an order was issued to seize all arms in the highlands, where Jacobite support had been strongest. Two of the weapons confiscated were swords from the North Inch battle held at the home of the MacIntosh chief. An appeal to the Duke of Cumberland brought a rare display of magnanimity and the relics were returned. Another trophy from the slaughter in Perth is the Feadan Dubh, the “Black Chanter” from the pipes carried by the Clan Chattan piper who killed his counterpart before expiring from his own wounds. The Chanter’s maintenance is regarded as essential for the prosperity of the MacPherson division of Clan Chattan, though this did not prevent it from being auctioned off by court order along with all the goods of Cluny Castle (home of the MacPherson chiefs) in 1943. Fortunately it was purchased by the clan association, and placed in the MacPherson clan museum at Newtonmore, where it may be viewed today. Despite the reverence given this relic, the first recorded mention of the chanter (which is cracked along its length) dates from 1821, when the object was returned to the MacPherson Chief after having been apparently loaned to the Grants of Glenmoriston. According to an account of 1831 the chanter was borrowed at some prior and unrecorded date by the Grants after a large group of their warriors were defeated by three MacDonalds making free with their cattle. The chanter was known to restore courage to those who heard its song, and the MacPherson chief appears to have loaned this valuable relic to the Grants with the slighting comment that the MacPherson men had no need of such an object. The correspondence regarding its return suggests that the chanter already enjoyed a reputation for great antiquity in 1821. Sir Walter Scott, who knew the young MacPherson chief who regained the relic, mentions the chanter in his Fair Maid of Perth. In one of a number of oral traditions concerning the chanter an ethereal piper appeared over the Clan Chattan during the battle at North Inch. After encouraging the fighting wildcats of Clan Chattan with several frenzied tunes the apparition dropped the pipes to the ground. The instrument, being made almost entirely of glass, shattered completely, except for the wooden chanter. The chanter preserved in the MacPherson museum is made of lignum vitae, a wood available only in the West Indies and South America. This tropical wood was unavailable in 1396 Scotland, and the chanter is therefore of later manufacture, certainly no earlier than the 16th century. Other traditions claim that the chanter’s great powers were the result of blessings by St. Columba or St. Ciaran, giving the object an improbably early 6th century origin. The unlikelihood of the savage struggle at Perth providing an end to a Highland feud must have been known to the royal court, and it has been suggested by some that the contest was never really intended to be more than a courtly diversion, a royal entertainment for visiting dignitaries from France and England. The prohibition on armour and shields suggests that the death of the participants was a desired result, perhaps in the hope that some steam might be taken out of the feud through the death of many leading warriors. That the clan chiefs and most of their leading men appear to have avoided the battle suggests that they fully understood this intention. The smoldering enmity that persisted between the Camerons and Clan Chattan well into the 19th century demonstrates that Scotland’s lowland nobility had once again failed to penetrate the psyche of their turbulent Gaelic neighbours. This article first appeared in the April/Spring 2008 issue of Military Heritage Magazine. The author would like to thank the Clan Macpherson Museum in Newtonmore, Inverness-hire and members of the Clan Macpherson Association for assistance in researching this article. In the far north of Scotland the Highland mountains grow smaller, eventually leveling out into vast stretches of rolling countryside that end abruptly with rocky cliffs lurching out over the cold northern seas. Before the Celts arrived these lands were ruled by Norsemen, the powerful ‘Sea-Kings of Orkney’. The names of their settlements in Scotland’s northeast county of Caithness reflected their beliefs, like the town of Thurso, named for the Norse god Thor. Though the town still stands after all these centuries, it came perilously close to obliteration one day in 1649. That year’s raid on Thurso by a small group of veteran Irish fighters and a handful of Scottish highlanders is not found on any list of Scotland’s great battles, but the raid was significant largely for one reason – it marked the last gasp of the once powerful Irish brigade (known as ‘Redshanks’) that came to Scotland to aid the Marquis of Montrose and his Royalist forces during the British Civil War. Combining innovative tactics with somewhat antiquated weapons the Irish won a resounding series of victories for a year after their arrival in Scotland in 1644. Warfare in Britain was in transition during the 17th century. Pikes and muskets dominated the battlefield but there was still a place for men like the Irish who were expert in the use of sword and shield. The matchlock musket was difficult and time-consuming to load and could only be used effectively in battle by highly disciplined troops performing a complicated drill. In battle the musketeers commonly formed up in six ranks. After the front rank fired in volley they would ‘countermarch’ to the rear to begin reloading while the next rank moved to the front to fire their volley. Inexperienced troops found the maneuver difficult. Nervousness interfered with the dozens of steps involved in reloading the musket, while the men in the front rank tended to discharge their weapons quickly and without aim in order to take their place at the rear again as soon as possible. Many Civil War battles were lost because half-trained musketeers would have been more useful with pikes in their hands rather than firearms. Artillery was often present on the battlefield, but tended to be so poorly served that it had little impact. Unlike the romantic image of charge and counter-charge by valiant swordsmen against resolute defenders, many Scottish battles of the era degenerated into rock-throwing by both sides. The trained swordsmen of the highland clans had a fearsome reputation, but in reality they were always few in number. Most of the clansmen formed an untrained rabble, useful only for pressing home an advantage already won by the professionals in the first rank. In the impoverished Highlands there were few who could afford the expensive tools of a Celtic warrior – a broadsword, a targe (shield), a dirk (short-sword), a musket and pistols. Each clan maintained a small group of professional fighters who kept close to the chief and led the rest of the clan into battle. Most of the barefoot men brought on campaign had to wait for someone to be killed in order to seize a weapon for themselves. Nevertheless, the highlanders achieved several notable victories serving under Montrose, but their desire to return home immediately with their loot resulted in an unfortunate tendency for the highland ranks to dissolve after a victory as surely as if they had been defeated. In the end the total numbers brought to the battlefield mattered far less than the number of professional soldiers involved on each side. A small core of men skilled in the use of their weapons and tempered in the continental battlefields of the Thirty Years War could easily rout far larger numbers of inexperienced men. It was in this sense that the largely veteran Irish Brigade (which may have included many MacDonalds from the Western Isles) was able to have an immediate impact in the Scottish campaigns of the Civil War. Under their leader Alistair MacColla (sometimes known as ‘Colkitto’), the Irish perfected a tactic that came to be known as ‘the Highland Charge’ after its adoption by Scottish highlanders. The tactic involved getting in close to the enemy before letting off a single short-range volley from their muskets into the front ranks. The muskets were then tossed aside as the Irish and their highland allies took sword in hand to emerge screaming from the smoke of their musket-fire. With the hard-charging Celts bearing down fast only seasoned regulars could be expected to resist the urge to break and run at this point. Just as important to Montrose as the fearsome reputation of his Irish fighters was their discipline under fire and their willingness to fight defensive actions as well as charge headlong into the enemy. Between battles the brigade remained an organized, armed force while the highlanders came and went according to their needs and whims. To be fair, most of the highlanders had farms to tend to, animals to care for and families who were unlikely to survive long without male providers and defenders. Any booty that could be obtained through battle was desperately needed at home. In mid-1646 Charles surrendered to the Scottish army campaigning in England. In a bizarre turn of events the King now made an alliance with his bitter foes, the Scottish Covenanters (so-named for their ‘national covenant’ against the King’s attempts to interfere with Scottish Protestantism). The latter insisted the King disband his forces. Many of the surviving Irish fighters in Scotland began to return home in small groups or joined up with armed groups in the Western Isles and Highlands. Alistair MacColla refused to lay down his arms but was soon bottled up in Kintyre with a group of Irish and highlanders (mostly MacDonalds) by the pro-government Campbells. MacColla was driven out the next spring, fleeing to Islay Island and eventually to Ireland. By February 1647 the Covenanters had tired of the King’s prevarications in fulfilling their demands. Charles was turned over to the English Parliamentarians and the Scottish army returned home, ready to mop up the last Royalist resistance. Isolated castles and their Royalist garrisons fell one by one. Captured highlanders were typically paroled, but the Irish were almost always massacred, sometimes by the hundreds. It quickly became routine to hang any Irishman captured in Scotland, encouraging those Irish Redshanks still at large to make their way back to Ireland. Many Catholic highlanders joined them to continue the fight in Ireland, but these groups were soon destroyed in a pair of disastrous battles. On January 30, 1649, Charles I was executed by the Parliamentarians in London. By this time there were few Irish fighters left in Scotland. Those who remained at first fought on as bands of guerrilla fighters, but they eventually developed a taste for looting, robbery and extortion. One of these bands was led by Donald Macallister Mullich, a “powerful and ferocious” Irishman who fought under Montrose in the Civil War. The band’s activities gained notice after they became involved in a spectacular robbery with Niel MacKay, leader of the Abrach MacKays in Strathnaver (please note, “Niel” is not a misspelling). A year after the robbery Niel MacKay arrived in Thurso to visit Sir James Sinclair of Murkle. He seems to have been followed there by Macallister, who had added several Highland desperadoes to his band of hell-raisers. As was his habit wherever he went, Macallister sent a message the civic leaders of Thurso demanding coin and provisions. Outraged by their refusal, the Irish captain decided to help himself by raiding the town on a Sunday when everyone would be in St.Peter’s church. Macallister was also determined to wreak his revenge for the townspeople’s defiance by torching the church during services. When one of his ruffians objected to such blasphemy, Macallister replied in bold Gaelic; “In defiance of God and the Sunday, Donald will spill blood”. 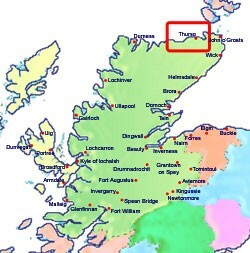 At the time, MacKay was living with a handful of retainers in a house at a fair distance from Thurso. 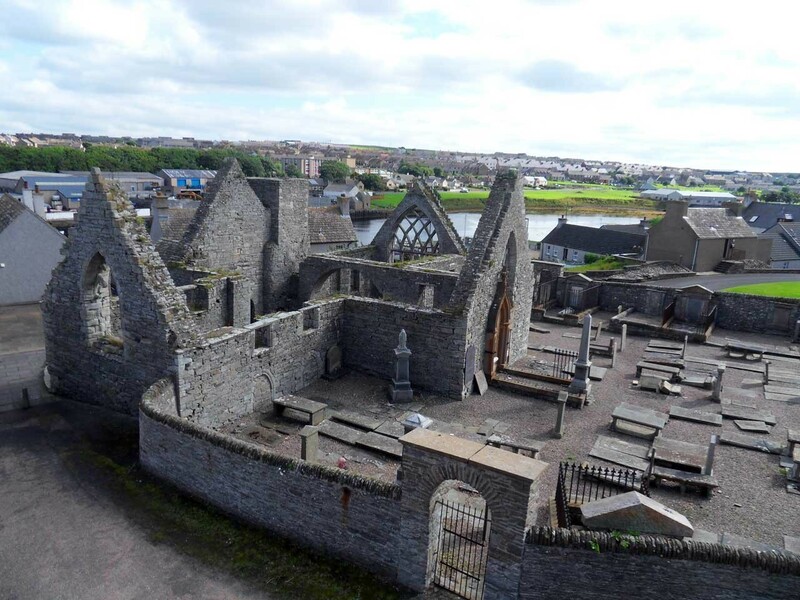 When the locals learned of Macallister’s arrival outside the church, they armed themselves and led by Sir James Sinclair (who habitually took his sword to church) they attacked the bandits. Driven from Thurso, Macallister headed to MacKay’s house with the enraged citizens close behind him.Despite being close friends with the Irishman, MacKay may have been unaware of Macallister’s plans for Thurso and was certainly unprepared for battle with only a small group of men at hand. The arrival at MacKay’s home of his recent ally Macallister and his raiding party was enough to convince the people of Thurso of MacKay’s connivance in a scheme to pillage the town and murder its people. It was not long before MacKay and his men were fighting side-by-side with Macallister’s bandits. The fight was bitter and relentless, with the caterans defending the house falling one by one to the furious attackers. Having survived countless battles, there was a common belief that a lead bullet could not kill the Irish marauder Macallister. One of Sir James Sinclair’s servants cut a silver button from his master’s coat and loaded it into a pistol. Determined to slay Macallister, the would-be killer succeeded only in piercing the Irishman’s ear. Surprised but still on his feet, Macallister coolly exclaimed; “Hoot! The fellow, he’s deafened me!” Eventually steel, not lead or silver, brought down the notorious freebooter. Niel MacKay was killed in the early stages of the fight. Sir James, unaware of his friend’s death (and perhaps uncertain about his role in the attack), ordered his men “Let no man touch Niel MacKay!” When informed that MacKay had already fallen, Sinclair announced gravely; “Then spare none”. The question of MacKay’s involvement remains open. Was it mere coincidence that Macallister’s men arrived at Thurso just behind him? There seems little reason for MacKay to contemplate such a desperate and despicable act as burning a church with its congregation still inside, particularly in his own region, where retribution would be swift and inevitable. Yet, when the going got rough for the freebooters in Thurso, they headed immediately for the house where MacKay was staying. They may have expected the help of MacKay and his men after aiding them against the Earl of Sutherland the previous year. Having realized that the bandits intended to burn them alive, the seething mob that poured out of Thurso in pursuit was probably not in the mood to listen to explanations of innocence. In any case MacKay and his men were of the professional fighting class, and once under attack would not have failed to respond in kind immediately. None were spared to answer these questions. Only two of the bandits escaped the massacre, fleeing half a mile along the rocky sea-side cliffs to the village of Scrabster, where they were set upon and killed. In Robert MacKay’s 1829 history of the Clan MacKay, the author recalled seeing the place of their death marked by two large stones. 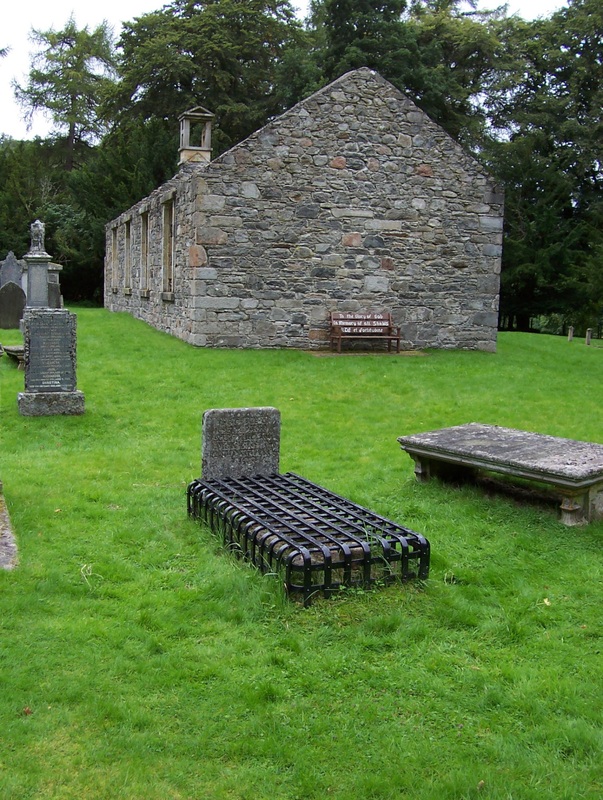 The bodies of the rest were buried at the main entrance of the church (last used for services in 1832 and now a picturesque ruin). The remains of the caterans do not seem to have carried much respect with the locals; Robert MacKay records seeing in the possession of a Thurso merchant a remarkably large molar tooth recently pulled from one of the skulls. Niel MacKay’s mortal remains were another matter. Sir James was grief-stricken at the death of his friend who, moreover, had been his guest in the area. Sinclair ordered MacKay’s body to be interned in his own family plot, with the late chief’s coat-of-arms carved on the gravestone. It being the custom in the north at the time to take revenge for the death of any chief, Niel MacKay’s son, also named Niel, began the hunt for the men who brought down his father. The younger Niel killed a man closely involved, but the actual culprit eventually tired of being hunted and fled abroad. With their days of victories under Montrose and Alisdair MacColla long behind them, the last of the ‘Redshanks’ met an ignoble death, their bones dumped in a pit outside the very church they intended to burn. In the following year, 1650, Montrose attempted a comeback from the Orkney Islands that lay within sight of Thurso across the northern sea. After crossing to the mainland with his hastily raised force of Orkney natives and Danish mercenaries (a poor substitute for MacColla’s Irish Brigade), Montrose was quickly defeated and sent on to Edinburgh to be hanged and quartered. His brilliant ally Alistair MacColla had already been killed at the 1647 battle of Knocknanuss in Ireland when his men made the fatal mistake of dispersing to loot the enemy’s baggage train after slashing their way through the Parliamentarian infantry. The massacre of Macallister and his men at Thurso brought a brutal end to the Redshanks in Scotland. It was not the end of Irish fighting men in Scotland, however. That would wait another hundred years for the end of Prince Charles Stewart’s failed rising of 1745-46.